Enchin (円珍, Enchin?)(d. 891) was the founder of the Jimon School of Tendai Buddhism, and Chief Abbot of Miidera at the foot of Mount Hiei. After succeeding Ennin to the post of Tendai Zasu, or Chief Tendai Abbot, in 873, a strong rivalry developed between his followers and those of Ennin, who remained abbot at Enryakuji, atop the mountain. The rivalry was purely geographical, and was not based on sectarian differences over interpretations of practice or doctrine; nevertheless, it was an intense rivalry which eventually broke out into violent conflict. Unlike some major Buddhist leaders, Enchin strongly supported the worship of native gods, and certain elements of Confucianism. In a famous memorial speech in 887, he discussed the respect T’ang China had for Japan because of Japan’s encouragement and welcoming of the ideals of Li (Propriety) and Yi (Righteousness). 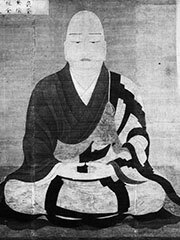 He warned that, though Enryakuji was founded with the native gods (kami) in mind, neither Enryakuji nor Miidera were at the time worshipping the gods of Mount Hiei, and that this was a dangerous violation of Confucian principles. Sansom, George (1958). ‘A History of Japan to 1334’. Stanford, California: Stanford University Press.